MiG 17 .... A True Fighter .... A Real Warbird .... A Classic .... Also My Former Hawker Hunters and MiG 15s... All Great Fighters ................... Check Your Six! I'm pleased that you've taken the time to look at this website and hope you'll find its pages helpful. If you'd like to see my current ride, go to the Yak 52 page to your left. 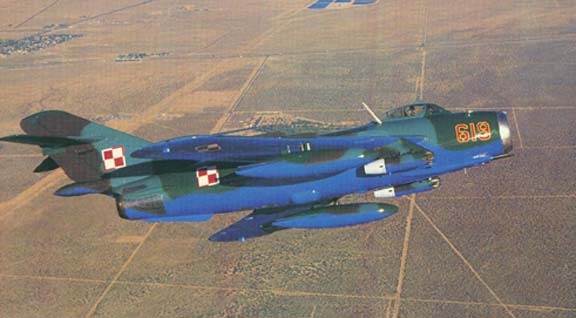 Also, don't miss the Hawker Hunter page. We flew them across the Atlantic in 1995. This particular MiG17 is an exceptional aircraft, and is considered by many to be one of the nicest looking in the United States. It has been featured in magazine articles, national television newscasts, and movies. I personally imported it from Poland in 1992 and have been enjoying it ever since. 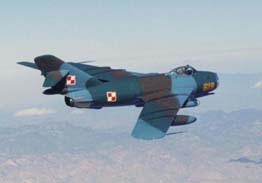 N619M is actually a Polish built Lim 6bis which is the last derivative of the MiG 17. Its serial number is 1J0619 and it was built in 1963. This makes it one of the last twenty MiG 17s built worldwide. 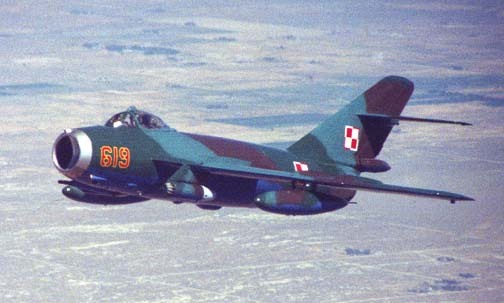 I purchased it from the Polish government in 1992, while I was in Poland, and it had just come out of service with the Polish Air Force. Even today, ten years later, It has less than 1800 total hours on the airframe since new. 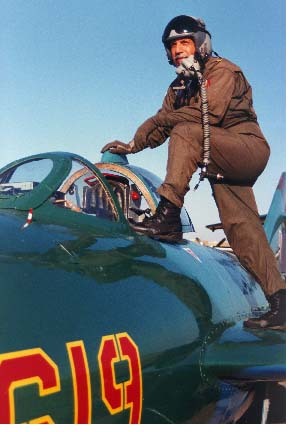 The Lim 6bis is distinguished from earlier MiG 17 models in that this model carries two UB16-57 rocket pods. This armament is in addition to its two 23mm and one 57 mm cannons. It also has provisions for a drag chute. N619M also has a camera pod on the lower right side of the fuselage because it was used as a ground attack / reconnaissance fighter. You can see the 57 mm cannon and rocket pods in the photo above. This particular shot was taken over Edwards AFB in 1997 from a T-38 Talon after I had just completed a series of sorties with the USAF Test Pilot School. In addition to the aircraft, the package being offered includes two spare engines, one still in the crate and the other on an engine stand, and a spare afterburner, also still in the crate. Other spare parts include a canopy, a set of new canopy seals, a drag chute, engine accessories such as pumps, filters and generators, new brake bladders and pucks, a fuselage fuel tank, flight and engine instruments, landing gear assemblies, extra ailerons and flaps, and various other parts. You should be able to operate and maintain this aircraft for years to come without needing much of anything. Please feel free to browse the pages on this website for some photos and more details.